EDAC Magnetic Jack connectors are highly integrated devices that combine network magnetics and RJ45 connectors. Magnetic jacks combine connectivity with signal conditioning, electromagnetic interference suppression and signal isolation. These parameters were previously performed by separate and discrete magnetic components mounted on the PCB board. 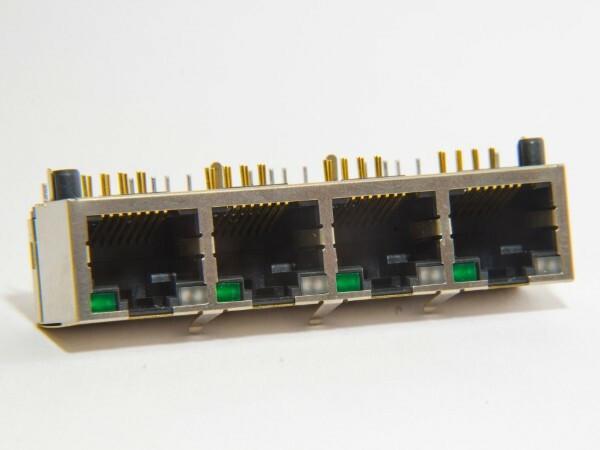 Available as single or stacked multiport options they are used in Data, Telecom, Networking and Home Entertainment markets for applications such as Servers, Hubs, Routers, Printers, Computers, Set Top Boxes and Digital TV’s. The demand for EDAC RJ45 Magnetic Jacks is increasing strongly as designers continue the quest for maximum optimisation of PCB real estate. In addition to the benefit of removing certain components from the board itself, EDAC Mag Jacks will simplify and streamline the assembly process while continuing to provide minimal cross-talk and improved EMI Performance. Inductance: @ 100KHz/0.1V, 8ma DC. Bias: 350uH Min. EDAC magnetic jack form factors include single, multi-port, stacked, and USB solutions that are widely used in Telecom, Data, Networking, and Home Entertainment markets for various applications, such as Servers, Switching Hubs, Network Routers, Printers, Set-top-boxes, Monitoring Equipment, Personal Computers, and Digital LCD TV’s.